Cloud computing provides new opportunities to the gaming industry and solves the prevailing issues as well. The technology almost embraces the sector and has much more to contribute to the evolvement of the growing gaming industry. The application of cloud computing is not only beneficial for enterprises but also for the consumers. With the support of cloud technology, other wings of entertainments such as music, television, etc offer extensive content to users through a variety of devices such as PCs, smartphones, Smart TVs, etc, and gaming industry will not be an exception. Gaming is a rapidly growing industry and it accounts for the revenue of $68 billion. 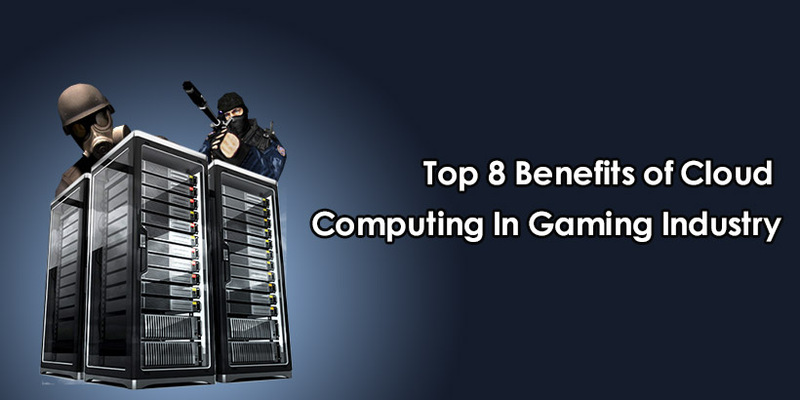 The blog describes the top 8 benefits which gaming industry endow with the support of cloud technology. The industrial level security used by cloud computing companies prevents external interruptions such as hacking. In Cloud systems, the information is stored inside a virtual storage space and which makes the platform safer than other traditional applications. Using the highly scalable cloud platform, High-end games can be played even on lower-end machines. The limitation caused by memory requirements, graphic capacity and processing power diminishes with cloud solutions and thus provides users, an exceptional gaming experience. In traditional models of gaming, the companies are required to pay more for bandwidth when the traffic in the system is high. This usually happens when companies have released a new gaming title. In normal traffic periods, gaming companies use about 10 percent of server space and bandwidth and reserve the remaining 90 percentage. The cloud systems follow a ‘pay as you go’ payment strategy in which gaming companies pay only for the resources which they have utilized. Even cloud is an advanced technological concept, it is easy to implement, and allows the user to access the games from any device from any location without even downloading and configuring applications. Unlike in other systems, the physical gaming software is not available to the market which avoids the chances of piracy. Instead of the physical computers, the gamers play games in cloud servers with an access on their personal computers. So cloud diminishes the chances of unauthorized manipulation and interruptions and maintains the novelty of the game. Rather than depending on the “consoles”, cloud computing supports the usage of multiple devices such as smartphones, laptops, palm-held devices, desktops, etc. The game players can enjoy the games from anywhere in the world without even carrying the console. Through the support of cloud computing, game players can enjoy their moments with a broader range of devices which belong to their routine usage. Compared to traditional applications, in terms of the storage capacity, cloud applications are more flexible and scalable. This makes gaming companies to provide information to the gamers as soon as they log into their account. Cloud computing platforms help gamers to perform the functions, such as saving the game or protecting it from regular access without any difficulties. The immediate response and regular access provide gamers more delightful experience and upkeep their satisfaction levels. Cloud provides the gamers the chance to play multiple games at a time. This helps companies to generate more revenue and gamers to get a delighting experience. It makes the gaming sector more dynamic by bringing active involvement of the gamers and the providers. Indeed, it forms a scenario where highly innovative and constructive contributions happen. Instead of focusing on producing the hardware or consoles which are portable and easy to use, game-makers concentrate on delivering interesting and long lasting game content ,with the support of cloud computing. Cloud based gaming is beneficial for both the customers and companies. It is a platform for innovation and major game makers such as Nintendo, Microsoft and Sony are providing delighting content with the support of the technology. Cloud gaming eliminates the requirement of carrying the console and provides them speedy access to multiple games through laptops, smart phones, desktops. In fact, cloud computing eliminates the existing concerns in the gaming industry and replaces it with new opportunities. Cloud computing revolutionizes the gaming industry by helping game-makers to generate more sales and returns and at the same time engage customers through the exceptional gaming experience.